For other people with the same name, see Mohammed IV (disambiguation). Mehmed IV (Ottoman Turkish: محمد رابع Meḥmed-i rābiʿ; Modern Turkish: IV. Mehmet; also known as Avcı Mehmet, Mehmed the Hunter; 2 January 1642 – 6 January 1693) was the Sultan of the Ottoman Empire from 1648 to 1687. He came to the throne at the age of six after his father was overthrown in a coup. Mehmed went on to become the second longest reigning sultan in Ottoman history after Suleiman the Magnificent. While the first and last years of his reign were characterized by military defeat and political instability, during his middle years he oversaw the revival of the empire's fortunes associated with the Köprülü era. Mehmed IV was known by contemporaries as a particularly pious ruler, and was referred to as gazi, or "holy warrior" for his role in the many conquests carried out during his long reign. Under his reign the empire reached the height of its territorial expansion in Europe. From a young age he developed a keen interest in hunting, for which he is known as avcı (translated as "the Hunter"). In 1687 Mehmed was overthrown by soldiers disenchanted by the course of the ongoing War of the Holy League. He subsequently retired to Edirne, where he resided until his natural death in 1693. Mehmed ascended to the throne in 1648 at the age of six,[nb 1] during a very volatile time for the Ottoman dynasty. The empire faced palace intrigues as well as uprisings in Anatolia, the defeat of the Ottoman navy by the Venetians outside the Dardanelles, and food shortages leading to riots in Constantinople. It was under these circumstances that Mehmed's mother granted Köprülü Mehmed Pasha full executive powers as Grand Vizier. Köprülü took office on 14 September 1656. Mehmed IV presided over the Köprülü era, an exceptionally stable period of Ottoman history. Mehmed is known as Avcı, "the Hunter", as this outdoor exercise took up much of his time. Mehmed's reign is notable for a revival of Ottoman fortunes led by the Grand Vizier Köprülü Mehmed and his son Fazıl Ahmed. They regained the Aegean islands from Venice, and Crete, during the Cretan War (1645–1669). They also fought successful campaigns against Transylvania (1660) and Poland (1670–1674). When Mehmed IV accepted the vassalage of Petro Doroshenko, Ottoman rule extended into Podolia and Right-bank Ukraine. 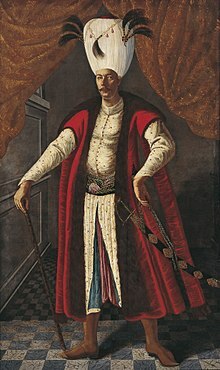 His next vizier, Köprülü Mehmed's adopted son Merzifonlu Kara Mustafa, led campaigns against Russia, conquering Chyhyryn in 1678. He next supported the 1683 Hungarian uprising of Imre Thököly against Austrian rule, marching a vast army through Hungary and besieged Vienna. At the Battle of Vienna on the Kahlenberg Heights, the Ottomans suffered a catastrophic rout by Polish-Lithuanian forces famously led by King John III Sobieski (1674–96), and his allies, notably the Imperial army. On 12 September 1683 the Austrians and their Polish allies under King John III Sobieski took advantage of dissent within the Turkish military command and poor disposition of his troops, winning the Battle of Vienna with a devastating flank attack led by Sobieski's Polish cavalry. The Turks retreated into Hungary, however this was only the beginning of the Great Turkish War, as the armies of the Holy League began their successful campaign to push the Ottomans back to the Balkans. After the second Battle of Mohács (1687), the Ottoman Empire fell into deep crisis. There was a mutiny among the Ottoman troops. The commander and Grand Vizier, Sarı Süleyman Pasha, became frightened that he would be killed by his own troops and fled from his command, first to Belgrade and then to Istanbul. When the news of the defeat and the mutiny arrived in Istanbul in early September, Abaza Siyavuş Pasha was appointed as the commander and soon afterward as the Grand Vizier. 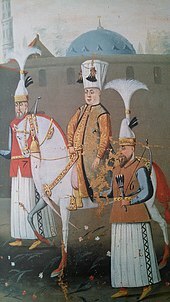 However, before he could take over his command, the whole Ottoman Army had disintegrated and the Ottoman household troops (Janissaries and sipahis) started to return to their base in Istanbul under their own lower-rank officers. Sarı Süleyman Pasha was executed, and Sultan Mehmed IV appointed the commander of Istanbul Straits, Köprülü Fazıl Mustafa Pasha, as the Grand Vizier's regent in Istanbul. Fazıl Mustafa made consultations with the leaders of the army that existed and the other leading Ottoman statesmen. After these, on 8 November 1687 it was decided to depose Sultan Mehmed IV and to enthrone his brother Suleiman II as the new Sultan. Mehmed was deposed by the combined forces of Yeğen Osman and the Janissaries. Mehmed was then imprisoned in Topkapı Palace. However, he was permitted to leave the Palace from time to time, as he died in Edirne Palace in 1693. He was buried in Turhan Hatice Sultan's tomb, near his mother's mosque in Constantinople. 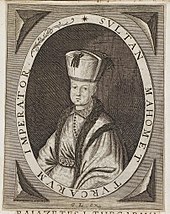 In 1691, a couple of years before his death, a plot was discovered in which the senior clerics of the empire planned to reinstate Mehmed on the throne in response to the ill health and imminent death of his successor, Suleiman II. His favourite harem girl was Emetullah Rabia Gülnuş Sultan, a slave girl and later his wife. She was taken prisoner at Rethymno (Turkish Resmo) on the island of Crete. Their two sons, Mustafa II and Ahmed III, became Ottoman Sultans during 1695–1703 and 1703–1730 respectively. ^ He is often reported as having been seven years old upon his accession, a result of the Turkish method of calculating age. ^ a b c Börekçi, Günhan (2009). "Mehmed IV". In Ágoston, Gábor; Bruce Masters (eds.). Encyclopedia of the Ottoman Empire. p. 370-1. ^ Baer, Marc David (2008). Honored by the Glory of Islam: Conversion and Conquest in Ottoman Europe. Oxford University Press. p. 165. ISBN 978-0-19-979783-7. ^ Afyoncu; Uğur Demir, Erhan (2015). Turhan Sultan. Istanbul: Yeditepe Yayınevi. p. 27. ISBN 978-605-9787-24-6. ^ Baer, Marc David (2008). Honored by the Glory of Islam: Conversion and Conquest in Ottoman Europe. Oxford University Press. p. 35. ISBN 978-0-19-979783-7. ^ Finkel, Caroline (2005). Osman's Dream: The Story of the Ottoman Empire, 1300-1923. New York: Basic Books. p. 197. ISBN 978-0-465-02396-7. ^ Baer, Marc David (2008). Honored by the Glory of Islam: Conversion and Conquest in Ottoman Europe. Oxford University Press. p. 27. ISBN 978-0-19-979783-7. ^ Streusand, Donald E., Islamic Gunpowder Empires: Ottomans, Safavids, and Mughals (Boulder, Colo.: Westview Press, 2011), p. 57. ^ a b c d Silahdar Findiklili Mehmed Agha (2012). ZEYL-İ FEZLEKE (1065-22 Ca.1106 / 1654-7 Şubat 1695). pp. 530, 752–53, 1095, 1290. ^ Sakaoğlu 2008, p. 380. ^ Uluçay 2011, p. 109. ^ Uluçay 2011, p. 111. ^ a b Silahdar Findiklili Mehmed Agha (2001). Nusretnâme: Tahlil ve Metin (1106-1133/1695-1721). pp. 135, 458–9. ^ Uluçay 2011, p. 110.